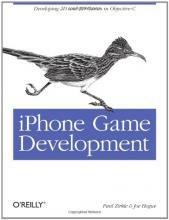 If you want to create games for the iPhone, you'll find this book packed with guidelines on the basics of game development, the fundamentals of iPhone programming, special graphics and audio needs for games, tips on handling in-game physics, strategies for AppStore publication, and much more. "iPhone Game Development" details the process with lots of examples, and provides plug-in classes to compensate for the iPhone's lack of support for certain areas of game programming. Throughout the book, the authors stress the importance of good performance and response time, and include numerous tips and alternative suggestions for maximizing performance in different types of games. Topics include: Basics of Objective-C and iPhone programming with XCode; How to create a robust, scalable framework for a game; Considerations for adapting the iPhone interface to games; 2D and 3D graphics; Animation and integrating with a physics engine; Music and audio effects; Menus and controls; and, Publishing to the AppStore. Paul Zirkle has five years of mobile game programming experience and is currently a Lead Mobile Programmer at Konami Digital Entertainment. He has worked on over 40 titles, including porting, re-writing and full development. Occasionally, Paul is called upon to give lectures on game development at the University of Southern California. Joe Hogue has five years of mobile game programming experience. He worked with Paul at Konami and currently works for Electronic Arts as a Mobile Programmer. Joe has worked on over 40 titles as well, including porting, re-writes and full development. Joe has written an iPhone game that is currently being submitted to the iTunes AppStore.